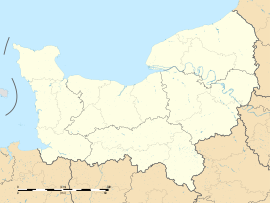 Héricourt-en-Caux is a commune in the Seine-Maritime department in the Normandy region in northern France. A forestry and farming village by the banks of the Durdent river, in the Pays de Caux, some 33 miles (53 km) northeast of Le Havre, at the junction of the D131, D233 and D149 roads. The church of St.Denis, dating from the nineteenth century. The chateau de Boscol, dating from the sixteenth century. The motte of an old castle. Wikimedia Commons has media related to Héricourt-en-Caux. This Le Havre geographical article is a stub. You can help Wikipedia by expanding it.